Canopy beds are not just for young girls' bedrooms. These beds come in a variety of styles and can make an elegant addition to an adult's bedroom as well. The accessories that you use to outfit a canopy bed are just as important to the look of your room as the bed itself. What is the point of having a canopy bed without having a canopy top? The canopy top gives a luxurious, romantic, or exotic look to your bedroom. It can be made of a heavy, brocade fabric to give a medieval look, or it can be made from whisper-light netting used to give a dreamy, romantic look to your bedroom. 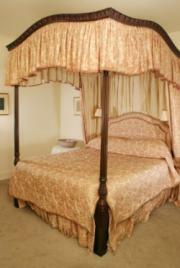 Attached to a frame on a four poster bed: These are the traditional types of canopies. They can be flat on top or arched, and the fabric is placed over a frame that attaches to the posts of the bed. Generally the canopy fabric will be cotton weight or heavier and will have a ruffle or pleats that hang over the sides of the frame. Some beds have an open work crochet type canopy that can be beautiful. Attached to the ceiling with a frame or hooks: This type is very versatile as it can be used with almost any sort of fabric to give a variety of looks. This is the type of canopy used to hang light fabrics and mosquito netting. Usually the fabric used will have some body and fall in graceful lines. However, you can hang brocade or a tapestry fabric from the ceiling with hooks, giving the bed the look of a traditional canopy without the need for a specific style of bed. Finding the right type of material for your bed canopy top can be a challenge. Some canopy beds are designed with four posts that hold a wire frame which the canopy top drapes over. The canopy material usually has eyelets that the posts slip through. Other types of canopy bed tops have a finer type of material, similar to mosquito netting. This type of material can be draped over a canopy bed frame or it can be hung from the ceiling with a wire hoop that spreads the material around the head of the bed. If you want a totally original look for your bedroom, you may want to hire a professional seamstress to hand make a custom bed canopy top. You will need to make sure the material you choose will go with the rest of your bedding. Carter Canopies, mentioned above, will make custom bed canopies and the company provides a toll-free number and e-mail contact on their website. Another online resource you can try for canopy tops is Ebay. If you want to find canopy tops locally, try the yellow pages, your local outlet mall or any specialty linen stores in your community. In addition to tops, there are three other basic types of accessories for canopy beds. Each one serves a different function and creates a total look. To some extent, you should use similar weights and types of fabrics for the whole bed (canopy, comforter, etc) in order to give the bed the cohesive look that it is known for. The same retailers that sell canopy tops are likely to carry the other accessories that you need as well. Long ago when canopy beds were first used, the side curtains served an important purpose. At night the curtains would be pulled around the bed and they would keep out the cold drafts that swept through the stone manor houses and castles.Nowadays most people don't need those curtains to keep warm in the winter. The curtains are usually there just for aesthetics and are often tied at the side of the posts on the bed. This can give a room a country Victorian look. Many times the canopy and curtain fabric will be white eyelet to achieve a sweet, pristine romantic feel. You can make your own canopy bed by hanging the canopy from the ceiling. You can also use hooks to hang side curtains around the bed. It is important that you not pull on them because they can fall easily. This is not the best choice for a child's room. The comforter is one of the most important canopy bed accessories because it will pull the curtains and canopy together and give a finished look to your bed. It is not necessary to have it completely match with the curtains and the canopy but you should carefully choose coordinating fabrics. Often matching or coordinating pillow shams will be added as well. The dust ruffle can also be matched or coordinated with the canopy and comforter. A flat piece of fabric fits between the mattress and box springs, and a gathered fabric cascades down from the box springs to the floor. If the bed is very high a special order size may be needed. Using two dust ruffles, one layered over a longer one in a different color or pattern, can be a charming addition to the right style of bedroom. When you are choosing accessories for your bed, consider the material the bed is made of. Carved mahogany will need a different fabric than wrought iron, for example. Finding the right canopy bed accessories will depend on the style of canopy bed you have, whether you're decorating a child or adult's room, and the overall style of your bedroom decor. Whether you're going for the chic, exotic look of the Arabian nights or a traditional, Victorian style theme, a canopy bed makes a dramatic bedroom centerpiece.